[S190] Index - GRO and Office of National Statistics, England & Wales Civil Registration Qtrly Indexes, Death: District of Christchurch, vol 2b, p824. [S542] Index - New Zealand BDMs online, at http://www.bdmhistoricalrecords.dia.govt.nz/, Birth Reg. No. 1868/7477. [S443] CD - NZ Marriages, CD - NZ Marriages 1836-1956 V2, NZ Registrar General's Folio 1034. [S542] Index - New Zealand BDMs online, at http://www.bdmhistoricalrecords.dia.govt.nz/, Marriage Reg. No. 1890/897. [S542] Index - New Zealand BDMs online, at http://www.bdmhistoricalrecords.dia.govt.nz/, Death Reg. No. 1949/25119, aged 81. Marguerite Elizabeth SIMPSON was born on 1 February 1861. [S220] Family Tree - provided by L Marshall, "Lawry Family tree" , This gives surname as Stephens-Scott. [S284] Index - New South Wales BDMs online, at http://www.bdm.nsw.gov.au, Death Reg. No. 19321/1929. [S284] Index - New South Wales BDMs online, at http://www.bdm.nsw.gov.au, Death Reg. No. 13824/1945. [S284] Index - New South Wales BDMs online, at http://www.bdm.nsw.gov.au, Birth Reg. No. 5070/1881. [S284] Index - New South Wales BDMs online, at http://www.bdm.nsw.gov.au, Birth Reg. No. 17349/1884. Alexander died before 1881 (as his wife declared herself a widow in the 1881 census). [S612] GRO Scotland, birth/bapt record, District of Ardchattan, OPR Births/baptisms, GRO 504/00 0010 0074 and 0075; these 2 records give baptism dates of 27 Jan and 27 Mar respectively - we conclude the minster was working from notes, and duplicated the records! 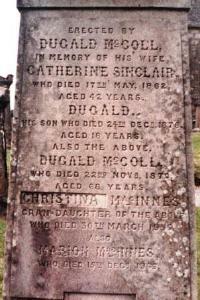 Duncan SINCLAIR was born in Scotland circa 1787. [S917] GRO Scotland, marriage record, Parish of Ardchattan, OPR Marriages, GRO 504/00 0010 118. [S612] GRO Scotland, birth/bapt record, District of Heriot and Warriston, Statutory Births, GRO 685/07 0236. [S484] Index - West Australian BDMs online, at http://www.bdm.dotag.wa.gov.au/_apps/pioneersindex/…, Birth Reg. No. 484/1911. [S688] Metropolitan WA Cemetery database, at http://www.mcb.wa.gov.au, Family grave, Karrakatta Cemetery, Anglican, section BA, grave 241, aged 74, married name MUIR. [S484] Index - West Australian BDMs online, at http://www.bdm.dotag.wa.gov.au/_apps/pioneersindex/…, Birth Reg. No. 67/1914. [S392] World War 2 Australian Nominal Roll, at http://www.ww2roll.gov.au, Service Number 5171 (WX36555). [S688] Metropolitan WA Cemetery database, at http://www.mcb.wa.gov.au, Fremantle Cemetery, Crematorium A, site A1, position 44, aged 52.